Posted on October 4, 2017 at 9:47 am. Mucho Vegas Casino is determined to make Hump Day something to look forward to rather than something to dread, and that’s why the casino has introduced the Midweek Reload Bonus promotion, giving players a much needed boost of fun every Wednesday. The Midweek Reload Bonus is simple – make a real money deposit on a Wednesday and Mucho Vegas will match the size of your deposit by 50% up to $100. Just make sure to select this bonus offer in the Mucho Vegas cashier when making your deposit, and deposit at least $25 or your currency equivalent. 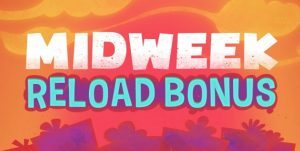 Note: The Midweek Reload Bonus is subject to a 30X wagering requirement, which means the amount of your bonus must be played through 30 times before you can withdraw any cash made from your bonus money. It’s a great time to take advantage of this bonus offer, with Mucho Vegas recently adding some hot new games to the mix, including Wild Spells by Pragmatic Play, Disco Double by iSoftBet and Blood Eternal by 3D software legends, BetSoft. Evolution Gaming’s live dealer suite has also recently been added at Mucho Vegas, so now is a great time to give this casino a go if you haven’t already. Not a member at Mucho Vegas? Sign up for an account and you’ll also be eligible to a giant welcome package that includes up to $1500 in matched deposit bonuses and 150 free spins. There’s no downloads needed and a large selection of trusted payment methods available. Join the fiesta today!